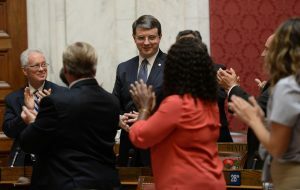 Delegates give newly elected West Virginia House of Delegates Speaker Roger Hanshaw, R-Clay, a standing ovation Wednesday morning. CHARLESTON, W.VA. — On a party-line 62-34 vote Wednesday, the West Virginia House of Delegates elected two-term Delegate Roger Hanshaw, R-Clay, to be the 58th speaker of the House. He will complete the unexpired term of former speaker Tim Armstead, R-Kanawha, who resigned Aug. 21 to run for state Supreme Court. As Hanshaw noted in his acceptance speech Wednesday, his tenure could be one of the shortest in House history, since both parties will caucus in December and the full House will vote Jan. 9 to elect a speaker to lead in the 84th Legislature. “We’ll do this process again in four months,” said Hanshaw, 38, a lawyer with the Bowles Rice law firm in Charleston.